Summary: Get all the nutrients from fruits and vegetables your body needs. Try it free for 30 days. Cut down on calories and lose weight! 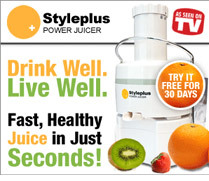 Whether you want to lose weight, feel more energetic, or just feel healthier, the Styleplus Power Juicer makes a perfect addition to your kitchen. The Styleplus Power Juicer’s surgical stainless steel blade and patented juice extraction technology extracts virtually all of the juice, giving you the fruits and vegetables your body needs.